Gilbert A. Trueb was born in 1901 at Wisconsin. He was the son of Alfred Trueb and Emelia L. Giese. Gilbert A. Trueb died in 1931. [S243] U.S. Federal Census 1920 U.S. Federal Census, by Ancestry.com, ED167. Dwelling 95. [S250] U.S. Federal Census 1930 U.S. Federal Census, by Ancestry.com, ED16. Dwelling 40. Name Variation William M. Trueb was also known as Willie. William M. Trueb was born in 1906 at Wisconsin. William M. Trueb died in 1972. Esther S. Trueb was born circa 1907 at Wisconsin. She was the daughter of Alfred Trueb and Emelia L. Giese. Henry Sorg married Caroline Kruhl, daughter of August Kruhl. Henry Sorg was born in 1838 at Germany also reported as 1839. He was the son of Philip John Sorg and Mary Hiltz. Henry Sorg died on 15 December 1928 at Sauk, Wisconsin. proved a man of solid worth and sterling character. industry and he desired to establish a permanent home in Wisconsin. injury, and at the close of his term of enlistment was honorably discharged. wife, natives of Germany, but then residents of Honey Creek Township. both to the school children and to the taxpayers of the township. Mr.
Sorg is a member of the Methodist Episcopal Church at Castle Prairie. Married Name Her married name was Sorg. Caroline Kruhl married Henry Sorg, son of Philip John Sorg and Mary Hiltz. Caroline Kruhl was born in 1845. She was the daughter of August Kruhl. Caroline Kruhl died on 15 December 1929 Caroline (Kruhl) Sorg death notice. Philip John Sorg married Mary Hiltz. Mary Hiltz married Philip John Sorg. Henry Sorg was the son of Henry Sorg and Caroline Kruhl. Married Name Her married name was Barto. Hattie Sorg was the daughter of Henry Sorg and Caroline Kruhl. Philip Sorg was born on 4 April 1876. He was the son of Henry Sorg and Caroline Kruhl. Philip Sorg married Emma Farris, daughter of Pierson Farris and Lydia Durbin, on 7 April 1900. Philip Sorg died on 10 August 1963 at age 87. Fred Sorg was the son of Henry Sorg and Caroline Kruhl. William Sorg was the son of Henry Sorg and Caroline Kruhl. Married Name Her married name was Baker. Louisa Sorg was the daughter of Henry Sorg and Caroline Kruhl. Louisa Sorg died before 1918. Joseph Hehenberger married Elizabeth (?). Joseph Hehenberger and Elizabeth (?) immigrated in 1852. Married Name Her married name was Hehenberger. Elizabeth (?) married Joseph Hehenberger. Elizabeth (?) and Joseph Hehenberger immigrated in 1852. Elizabeth Diehl was the daughter of Henry John Diehl and Julia Hehenberger. Elizabeth Diehl died at died in infancy. Name Variation Axel Thedor Braun was also known as Aksel. Name Variation Axel Thedor Braun was also known as A. T.
Axel Thedor Braun was born circa 1879 at Denmark. He married Emma Diehl, daughter of Henry John Diehl and Julia Hehenberger, circa 1902. [S244] U.S. Federal Census 1910 U.S. Federal Census, by Ancestry.com, ED128. Dwelling 83. Name Variation Warren Braun was also known as Myron. Warren Braun was born circa 1904 at Washington. He was the son of Axel Thedor Braun and Emma Diehl. Name Variation Hjalmar Braun was also known as Hilmer. Hjalmar Braun was born circa 1907 at Wisconsin. Name Variation August William E. Leopold Garske was also known as William. August William E. Leopold Garske was born on 16 August 1802 at Prussia. He married Henrietta Koplein before 1830. August William E. Leopold Garske died on 21 September 1890 at 88y 1m 5d at age 88. [S247] U.S. Federal Census 1870 U.S. Federal Census, by Ancestry.com, Dwelling 28. Married Name before 1830 As of before 1830,her married name was Garske. Henrietta Koplein was born circa 1800 at Prussia. She married August William E. Leopold Garske before 1830. Henrietta Koplein died before 1880. Name Variation Augusta Ost was also known as Augustus. Married Name 7 March 1888 As of 7 March 1888,her married name was Gade. Augusta Ost was born circa 1864 at Wisconsin. Augusta Ost married Heinrich Gade, son of Johann Heinrich Ludwig Gade and Anna Lueckensmeier, on 7 March 1888. Augusta Ost died after 1900. 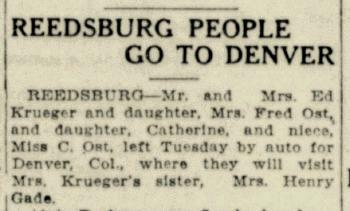 June 1880 Reedsburg, Sauk, Wisconsin Augusta Ost was listed as a daughter in Ferdinand Ost's household on the 1880 Census at Reedsburg, Sauk, Wisconsin; living next door to Henry Maas. 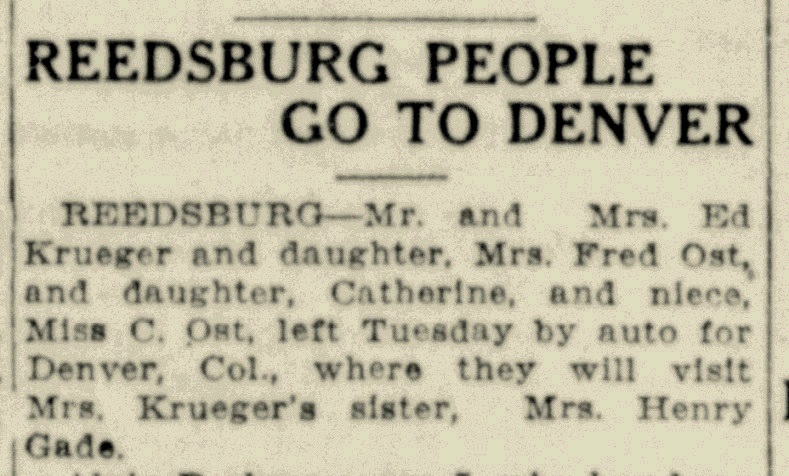 In August 1923 Mr and Mrs Ed Krueger and daughter, Mrs. Fred Ost, and daughter, Catherine, and niece, Miss C Ost, left Tuesday by auto for Denver, Col., where they will visit Mrs. Krueger's sister, Mrs Henry Gade. Albert Theodoer Ost was born on 25 September 1873 at Wisconsin. He was the son of Ferdinand Ost and Friedericka Garske. Albert Theodoer Ost married Edith Mary Schiefelbein, daughter of Gotfried J. Schiefelbein and Henrietta Middlesteadt, circa 1899. Albert Theodoer Ost died on 25 October 1956 at age 83. June 1880 Reedsburg, Sauk, Wisconsin Albert Theodoer Ost was listed as a son in Ferdinand Ost's household on the 1880 Census at Reedsburg, Sauk, Wisconsin; living next door to Henry Maas. 1 June 1905 Reedsburg, Sauk, Wisconsin He appeared on the census of 1 June 1905 at Reedsburg, Sauk, Wisconsin. [S245] U.S. Federal Census 1900 U.S. Federal Census, by Ancestry.com, ED142. Dwelling 485. William E. Ost married Anna Miller. William E. Ost was born in 1875 at Wisconsin. William E. Ost died on 6 April 1959. June 1880 Reedsburg, Sauk, Wisconsin William E. Ost was listed as a son in Ferdinand Ost's household on the 1880 Census at Reedsburg, Sauk, Wisconsin; living next door to Henry Maas. Name Variation Fred August Ost was also known as Frederick. Name Variation Fred August Ost was also known as Frederick August. Fred August Ost was born on 3 September 1877 at Wisconsin. Fred August Ost married Wilhelmine Thiele before 1901 at first marriage for both. Fred August Ost married Emma C. Viebranz, daughter of Carl Viebranz and Albertine Zibell, circa 1904 at second marriage for him; first for her. Fred August Ost died on 6 May 1954 at age 76. June 1880 Reedsburg, Sauk, Wisconsin Fred August Ost was listed as a son in Ferdinand Ost's household on the 1880 Census at Reedsburg, Sauk, Wisconsin; living next door to Henry Maas. Name Variation Mathilde Clara Ost was also known as Matilda Clara. Married Name Her married name was Krueger. Name Variation Mathilde Clara Ost was also known as Clara. Mathilde Clara Ost married Edward H. Krueger. Mathilde Clara Ost was born on 9 May 1880 at Wisconsin. Mathilde Clara Ost died on 1 November 1943 at age 63. June 1880 Reedsburg, Sauk, Wisconsin Mathilde Clara Ost was listed as a daughter in Ferdinand Ost's household on the 1880 Census at Reedsburg, Sauk, Wisconsin; living next door to Henry Maas. Name Variation Maria Ost was also known as Marie. Maria Ost was born circa 1904 at Wisconsin. She was the daughter of Henry Ost and Mary Flohr. [S364] Wisconsin State Census Wisconsin State Censuses, 1895 and 1905, by Ancestry.com, Dwelling 89. Name Variation Ferdinand Pufhal was also known as Pufahl. Name Variation Ferdinand Pufhal was also known as F. D.
Ferdinand Pufhal was born on 13 November 1848 at Hanover, Germany, also reported as 13 Nov 1847. He was the son of William Pufhal and Henrietta Christine (?). Ferdinand Pufhal married Henrietta C. Schultz circa 1869. Ferdinand Pufhal died on 7 November 1925 at age 76. Ferdinand Pufhal immigrated in 1857. [S248] U.S. Federal Census 1860 U.S. Federal Census, by Ancestry.com, Dwelling 1036. [S246] U.S. Federal Census 1880 U.S. Federal Census, by Ancestry.com, NA Film Number T9-1446 Page Number 213B. [S245] U.S. Federal Census 1900 U.S. Federal Census, by Ancestry.com, ED143. Dwelling 128. Name Variation Henrietta C. Schultz was also known as Henriette. Name Variation Henrietta C. Schultz was also known as Annetta. Married Name circa 1869 As of circa 1869,her married name was Pufhal. Married Name circa 1869 As of circa 1869,her married name was Pufahl. Henrietta C. Schultz was born on 4 November 1849 at Germany. She married Ferdinand Pufhal, son of William Pufhal and Henrietta Christine (? ), circa 1869. Henrietta C. Schultz died on 15 October 1931 at age 81. Henrietta C. Schultz had 6 with 6 living in 1900 children.